January 2019 monthly precipitation totals were generally above normal across the north and south, with near to below normal totals across the central part of the state. The heaviest precipitation was over southwest Minnesota, where heavy snow fell on January 18. The preliminary statewide precipitation average was .76 inches or 0.07 inches below normal. 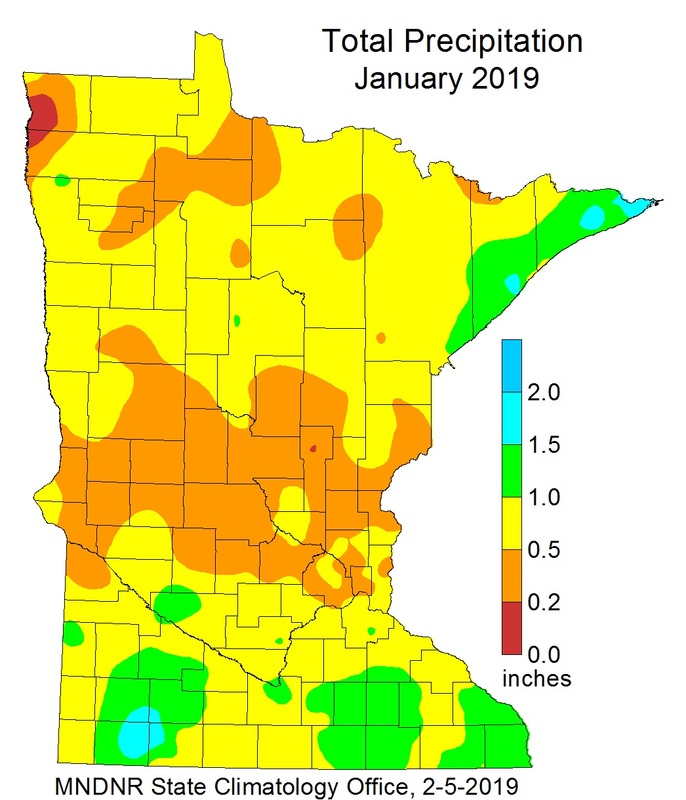 There were two significant snowfall events in Minnesota during January 2019. On January 18, Heavy snow fell roughly along Interstate 90 across the far southern counters of Minnesota. The heaviest snow fell in southwestern and south central Minnesota with 12.5 inches at Mapleton in southern Blue Earth County and a foot of snow at Winnebago in Faribault County. Heron Lake in Cottonwood County saw with the most with 15 inches. The second event was a strong clipper-like snowstorm on January 27-28 that dropped a wide swath of two to five inches of snow across central and southern Minnesota with a heavier pocket of snowfall over southeast Minnesota. Snowfall amounts up to eight inches were reported in Houston County. The snow events took a backseat to the roller coaster trip of temperatures. The first half of January was about nine degrees above normal and the second half was fourteen degrees below normal, more than offsetting the warmth. The preliminary statewide average for January 2019 is 2.8 degrees F below normal. The warmest temperature of the month was 49 degrees at Rushford and Winona Dam on January 6 with the well-publicized coldest temperature of the month of -56 degrees F at Cotton on January 27 and 31. Wind chill temperatures were some of the coldest seen in decades. The Twin Cities saw twelve hours straight of -50 degrees F or colder wind chill temperatures from 7pm on January 30 to 6am January 31. The coldest wind chill temperature reading was -55 degrees F at 11pm January 30. This was the coldest wind chill reading in the Twin Cities since January 19, 1985. A number of locations in northern Minnesota saw wind chill readings of -60 degrees F or colder including -65 degrees F at Hibbing at 8am on January 30. As of February 7, snow depth readings are deeper than the median across most of Minnesota. After a fairly snow-sparse January over east central Minnesota, there is now about four to eight inches on the ground. The deepest snowpack is over the central and the north. Eight to twelve inches of snow is common across south, except the far southeast corner. 12 to 24 inches of snow is common on the ground in the north. The highest totals are in the Superior Highlands with two to three feet of snow on the ground. 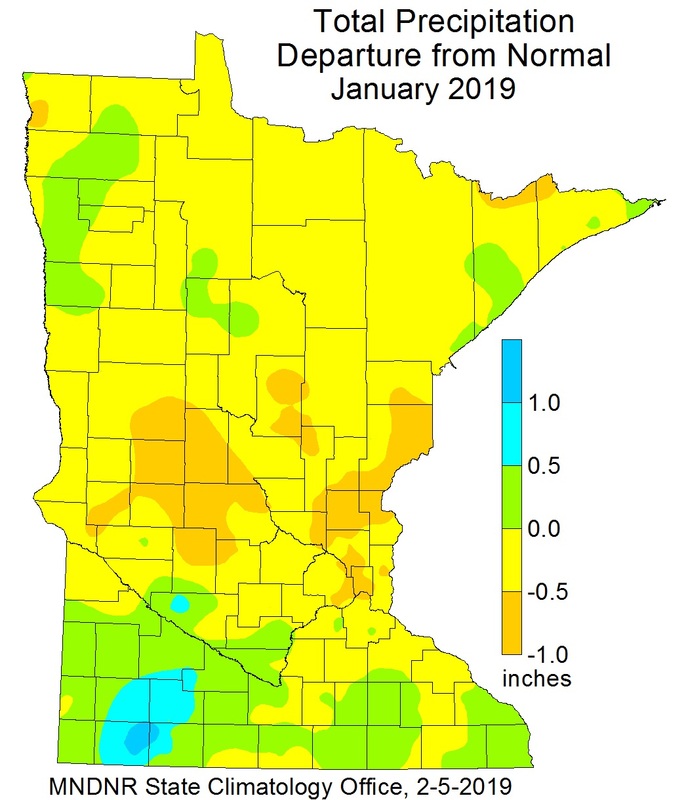 The U. S. Drought Monitor map released on February 7 depicts less than 2% of Minnesota under Abnormally Dry conditions, focusing mainly over western portions of the state. The rest of the state is free from any drought designation. The U.S. Drought Monitor index is a blend of science and subjectivity where drought categories (Moderate, Severe, etc.) are based on several indicators. The U.S. Geological Survey reports that stream discharge values (where winter measurements are possible) are normal to much above historical medians for the date for the few Minnesota rivers that have data. The Mississippi River at Brainerd has high flow conditions. Most rivers and streams are now impacted by ice. In their final report of the 2018 growing season (November 25), the Agricultural Statistics Service reported that topsoil moisture across Minnesota was 0 percent Very Short, 1 percent Short, 75 percent Adequate, and 25 percent Surplus. The potential for wildfires is currently rated by DNR Forestry as Low across Minnesota. Soil frost depths under sod are close to average for early February, generally around 15-24 inches in the central and south and around two feet in the Mississippi Headwaters and northwest Minnesota. Minnesota lakes, rivers, and wetland complexes are ice covered. Mild conditions for the first half of January didn’t help to thicken ice in southern Minnesota and but temperatures became more favorable for ice formation for the second half of the month. In general lakes first froze over in the middle of November. Some lakes had one of their earlier lake freeze over dates in recent years. Lake and river ice is never completely safe. On February 5, Lake Superior was 40.6% covered by ice, a slightly lower percentage for this date than last year, but much higher than in 2017. The maximum ice coverage for Lake Superior typically happens in late February. The February precipitation outlook offers a tilt toward above-normal conditions in Minnesota. February is typically the driest month of the year. Precipitation normals range from near one-half inch of liquid equivalent in western Minnesota to just over three-quarter of an inch of precipitation in eastern sections of the state. The median snow depth at the end of February ranges from under five inches in southwest Minnesota to over 18 inches on the ground in northeastern Minnesota (greater than 30 inches in the Lake Superior highlands). The February temperature outlook leans towards below normal conditions across Minnesota. Normal February high temperatures range from the low teens in the north to near 20 in the south early in the month, climbing to the mid-20s to low 30s by month's end. Normal February low temperatures range from near minus 10 degrees in the far north to the single digits above zero in southern Minnesota early in the month; ascending to the low single digits in the north, mid-teens in the south by the end of February. The 90-day precipitation outlook for February through April indicates equal chances for below, normal and above normal precipitation. The February through April temperature projection indicates a tilt towards above-normal temperatures in the northwest, with equal chances of below, normal and above normal temperatures elsewhere. soil profiles are moist due to above normal precipitation in 2018.
frost depths are near average. snow depths are above the historical median for the date in much of central Minnesota, the Mississippi Headwaters and the Red River Valley. Snow depths are also above the historical median in southwest Minnesota. Winter continues to make up for lost ground in February. One week into the month, it has been quite snowy. So far seasonal snowfall totals to date have been short of normal for most locations. Through February 6 the Twin Cities had 22.3 inches of snow so far for the season or 13.4 inches short of normal. St. Cloud was 3.9 inches short of normal with 24.7 inches. Duluth was also short of normal with 51.4 inches or 4.4 inches short of normal. International Falls was also short with 42.6 inches or 5.7 inches below normal. Rochester had above normal snowfall through February 6 with 38.3 inches, 4.8 inches above normal.